On Monday eBay kick started a program allowing its users to instantly sell their unwanted used smartphones. The US-only programme offers 'instant gratification' on smartphone sales with what appear to be much higher dollar values than via rival trade in schemes, from major mobile networks and so on. The biggest limitations on the scheme at present, beyond the geographic one, are that not all modern smartphones are eligible, and that the seller gets paid in eBay vouchers. Poking around the Instant Selling landing page it is very easy and quick to sell using the new method. As you can see in the embedded video, after a few selections and clicks you get a voucher for the designated amount instantly. At the present time eBay limits this facility to the following mobiles; Unlocked, Verizon and AT&T, Samsung Galaxy S7 to S9+, Apple iPhone 6S 16GB – iPhone X 256GB. It notes that T-Mobile, Sprint and Google Pixel and select LG products will be rolled into the scheme in November. 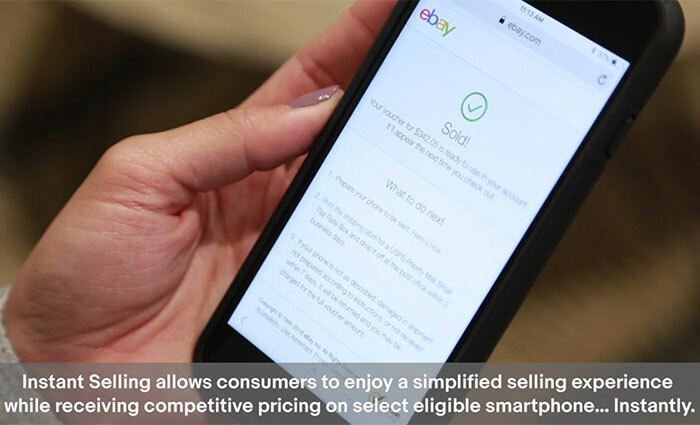 If you go through the process with a phone that isn't eligible for instant selling, eBay smartly lets you continue to list it, with a few more questions, via its regular auction/BIN process. Backing up its decision to create the smartphone Instant Selling scheme, eBay shares some comparative trade-in value data, as shown above. The values offered look good, for the limited hassle involved, but I am not familiar with usual USA buying/selling markets. eBay commissioned a study that found the majority of Americans (61 per cent) have never sold or traded in a smartphone they no longer use, and 40 per cent of Americans have two or more unused smartphones in their home. Average US citizens "simply don't realise how much their devices are worth, probably because trade-in values are typically so low," claimed Alyssa Steele, Vice President of Hard Goods, eBay.